In the late 1970's I often used to visit the Kelvingrove Gallery in Glasgow. One of the delights was if your visit coincided with a recital on the gallery's organ. This was an entirely different style of recital to one in a church; the organ was massive with a multicoloured array of stops and repertoire which veered towards transcriptions of popular classics. 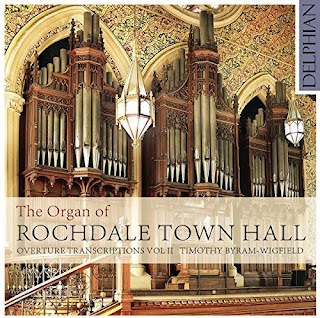 Timothy Byram-Wigfield recorded a recital on that organ for his first volume of his Overture Transcriptions series on Delphian, and this new disc, which is recorded on the organ of Rochdale Town Hall, he plays a second volume of Overture Transcriptions giving us a further glimpse into the half forgotten world of the symphonic organ. The organ in Rochdale Town Hall is a magnificent beast, built originally in 1913 had restoration work done in 1979 and 2013. Timothy Byram-Wigfield showcases it with a sequence of overtures by Otto Nicolai, Louis Spohr, Handel, Verdi and Tchaikovsky, plus music by Bach, in arrangement from the great age of British symphonic organ music. Timothy Byram-Wigfield explains in his note in the CD booklet that large scale metropolitan town halls developed partly as a result of the choral society movement, with choirs needing larger places to perform and as a result, larger organs to fill the new halls. Thus the development of the British symphonic organ tradition. And arrangers and composers developed a wide range of skills to show off the instruments in transcriptions of orchestral music. In an era without broadcasting this was a way of widening access to this type of music. To listen to these pieces is to enter a different world. The arrangements and transcriptions are intended to show off the huge range of colour and timbre on the organ, as well as the skill of the organist. With no sustaining pedal, the transcriptions of multi-voiced music must use other ideas. Timothy Byram-Wigfielddescribes the technique of 'thumbing down' associated with Edwin Henry Lemare and used extensively in Lemare's transcription of Tchaikovsky's Ouverture-Fantaisie 'Romeo et Juliette'. This is a technique whereby the hand plays on one manual whilst the thumb plays on another. This is very much the art that conceals art; listening to the pieces on the disc you are only aware of the skill required when you examine the way the multiple orchestra lines are dexterously handled, and the way that Timothy Byram-Wigfield combines legato with articulation effects on an instrument where the touch of the keys is not responsive like a piano. Speeds are sometimes slower than is ideal, but the Rochdale Town Hall organ is a big beast (with some 53 speaking stops and 3018 pipes) and frankly it is surprising how nimble Timothy Byram-Wigfield makes it. Other period touches include the overtures to Louis Spohr's Jessonda and Otto Nicolai's The Merry Wives of Windsor (popular pieces in the 19th century), and also the style of the overture to Handel's Tolomeo (Ptolomey) which reflects the huge symphonic Handel of an earlier era. Not everything is bombastic by a long chalk, and the music offers a wealth of quietly subtle playing. 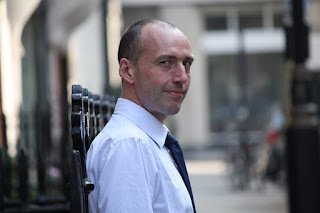 The CD booklet includes an extensive article by Timothy Byram-Wigfield which fills in the background both to the instrument and the repertoire, along with a description of the organ and its stops. It is wonderful that organs like the Rochdale Town Hall organ are still being kept in a state whereby such music can be experienced. There are still afternoon recitals on the organ, this year 12-2pm on 5 March, 21 May, 10 September, 8 October 2016, and you can have lunch or afternoon tea whilst you listen (further information from the council website).